Introduction: Whilst we know for certain that eutrophication in fresh waters is caused by increased nutrient levels, the relative influence of the two most important nutrients, phosphorus and nitrogen, is the subject of much debate. Recent work has asserted that eutrophication cannot be controlled by reduction in nitrogen (Schindler, 2008, 2016), and indeed there have even been suggestions that the addition of nitrate may be an effective way of countering blue green algal blooms (Schindler, 2016). Other work has presented a more balanced approach (Moss, 2012) and empirical studies have found nitrogen to be related to higher algal biomass (González Sagrario, 2005) and reduced submerged plant richness (James, 2005). Experiment: At the LMWE in Silkeborg Denmark we have in 2018 and will in 2019 address this issue by altering the nutrient input to the long running experiment and follow the ecosystem response. 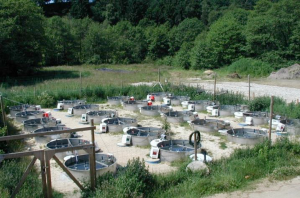 The current experimental set-up consists of 12 mesocosms at low nutrient levels and 12 where both phosphorus and nitrogen are added to increase nutrient loading. In addition, there are 3 temperature treatments: 1) Ref – a reference temperature which follows the ‘normal’ seasonal variation, 2) A2 treatment which is 2-3∞C above reference and 3) A2+50% which is 5-6∞C above reference. The mesocosms are flow-through systems with a retention time of ca. 2.5 month. They have sediment and the water is fully mixed. They are equipped with high frequency measurements of O2, temperature, pH and from July 2018 also chlorophyll and in some mesocosms also phycocyanin pigments. The mesocosms have been running uninterrupted since august 2003. In June 2018 we reduced the N-loading to the high N, P loaded mesocosms to the level of the low nutrient mesocosms (receiving groundwater only), but kept P loading at the usual high level. In June 2019, we will return to the normal high N-loading and again follow the ecosystem response for another year. TA users: We welcome researchers and students from abroad to contribute to the experiment, ideally by doing before and after N increase studies that complement our own studies. The number of projects is flexible. A total of at ca. 300-450 person days will be allocated to external users through Transnational Access provided under AQUACOSM for 2019 and coverage of travel costs for about six persons in total are included as well. Timing: The facility will be open from April and onwards. If you are interested, please contact Erik Jeppesen (ej@bios.au.dk) well before the application deadline, so we can advise you about possible options. The Lake Warming Mesocosm Experiment (LMWE) has been running an experiment with 2 nutrient levels crossed with three temperatures uninterrupted since August 2003. In June 2018 we plan to continue with high TP loading in the high nutrient mesocosms, but will drop N loading to the level in the low nutrient mesocosms (which only are receiving input with ground water). We will then follow the response of the entire lake ecosystems (structure and processes) the rest of 2018 and welcome researchers and students from abroad to contribute, ideally by measuring before and after the event. 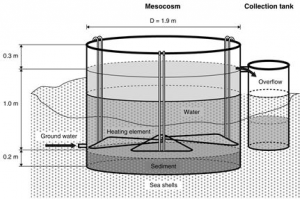 The retention times in the mesocosms are ca. 2.5 month. All AQUACOSM approved TA users are welcome to participate in the long-term experiment from beginning of 2018, preferably before and after June 2018. Expertise on measuring nitrogen cycling and also effects on GHG is of specific interest. In addition we have stored samples of water, phytoplankton and zooplankton (phyto, zoo not counted) from the beginning of the experiment and also welcome scientist and students to contribute to the analyses of those. Studies in the untouched low nutrients mesocosms are also welcome. At least 300 person-days will be allocated to external users through AQUACOSM Transnational Access provision in 2018. Access is offered to a minimum of 6 persons for 50 days each year. The number of projects is flexible. The AU Lake Mesocosm Warming Experiment (LMWE) is a unique long- term (with 12 years so far the world’s longest running) flow-through mesocosm experiment addressing climate-change effects on lakes under contrasting nutrient levels and water clarity. 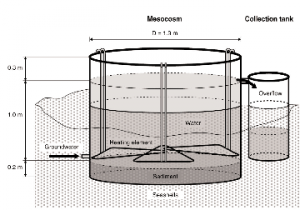 Twenty-four cylindrical outdoor mesocosms are used, each with a capacity of 2.8 m3 (Fig. 6.13.1). The mesocosms receive groundwater 6 times per day, resulting in a theoretical water retention time of 2.5 months. Water in the mesocosms is continuously mixed by paddles and heated by electrical elements. Three temperature regimes are run: ambient temperature and two elevated temperatures according to IPPC climate scenarios A2 and A2 + 50%, down-scaled to local 25 25 km grid cells. The modelled temperature difference for the A2 scenario is generally higher in August to January (max. 4.4 °C in September) than during the rest of the year (min. 2.5 °C in June). Individual mesocosms of each temperature regime are run at either low or high nutrient concentrations (4 replicates per treatment). The latter are obtained by weekly dosing of N and P.
Located 15 km from AU Silkeborg, the facility is equipped with a small lab building to facilitate accessory small-scale studies and analyses. A fully equipped lab is available at the AU freshwater central lab in Silkeborg. The mesocosm facility is on the road map of infrastructures as part of a Danish AnaEE project and it is also included in the European AnaEE list of experimental facilities for ESFRI. Fig. 6.13.1. 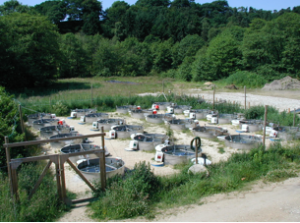 Aerial view (left) and schematic (right) of the Lake Mesocosm Warming Experiment (LMWE) in Denmark. A total of 900 person-days will be allocated to external users through AQUACOSM Transnational Access provision in years 2-4. Access is offered to a minimum of 6 persons for 50 days each year. Services currently offered by the infrastructure: The LMWE provides a unique opportunity to test for long- term warming impacts on trophic dynamics, nutrient balances, ecosystem metabolism, greenhouse gas exchange, adaptation and microevolution that are not possible at other locations in the world. Users have access to the laboratories, instrumentation, etc. at both the mesocosm facility and the AU freshwater lab in Silkeborg. Users of LMWE meet a highly international scientific community with many guests from both Europe and overseas. This includes numerous students and postdocs from Europe, Israel, China, Argentina and Turkey. Close cooperation with local scientists is encouraged to maximize outcomes. The facility was used in the FP7 REFRESH project and is currently included in the FP7 project MARS (http://www.mars-project.eu), running from 2014-2018, to assess effects of a heat-wave on shallow lakes. Additional projects are the European JPI Water project PROGNOS (2016-2019) assessing in-lake responses to change using near real-time models, and a Danish lake restoration project (CLEAR from 2012-2017; a Villum Kann Rasmussen Center of Excellence on lake restoration) involving a 15N spiking experiment. Support offered under AQUACOSM: All visitors will have access to the laboratories and instrumentation available at the facility. Beyond access to the LMWE, all users will receive scientific support for planning activities before and after arrival (typically initiated several months in advance) and hands-on training by the local scientific team. The visiting scientists will meet 1) an internationally leading team of aquatic scientists, headed by one of the most cited aquatic ecologists in the world and 2) a stimulating international environment with numerous scientists, students and postdocs from around the globe. The visitors will further benefit from competent technical and administrative staff associated with the facility, who can provide technical advice and assist with the purchase of consumables, lodging and other technical and administrative issues.